As Americans gear up for midterm elections on Tuesday, Nov. 6, a number of companies are helping their customers and workers get to the polls. Here's information on a number of deals and discounts. 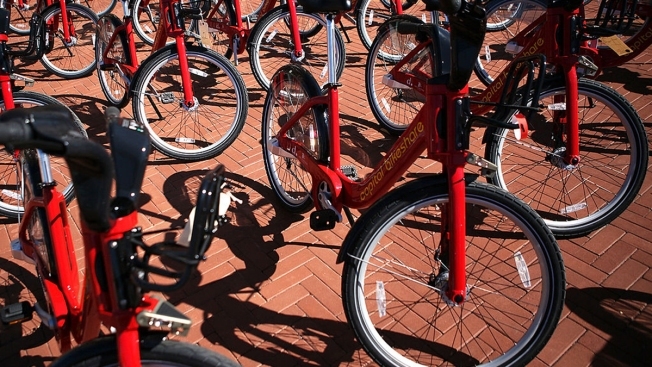 Bike-sharing company Motivate, which operates the D.C. area’s Capital Bikeshare network, announced Monday that it will offer free rides on Election Day on its nine bike systems across the country. “We want to make it easier than ever to pedal to the polls this Election Day,” Motivate spokeswoman Julie Wood said in a statement. “Too many Americans don’t vote because they lack reliable and affordable transportation options." Capital Bikeshare riders can use the code “BIKETOVOTE” to unlock a free day pass for the system’s more than 4,300 bikes and 500 stations across the D.C. area. The electric scooter company Lime announced Oct. 25 that it will offer free 30-minute trips for D.C. residents to get to and from their nearest polling station. “Transportation to the polls is often a challenge for many Americans on Election Day, so we’re doing our part to help,” Lime co-founder Brad Bao said in a statement. On Lime scooters, riders can enter the code “LIME2VOTE18” to unlock shared bikes, electric bikes and scooters. Adding to the list, Lyft and Uber announced free and discounted rides to the polls for the election, as well as voter registration and information resources for riders. Cava, the D.C.-based Mediterranean fast-casual chain, announced plans to give its 1,600 employees two hours of paid leave to go vote. “With the voter turnout being so low in the states, we’re trying to get people to be part of their communities and get them involved,” Cava co-founder Ted Xenohristos told Washingtonian. The outdoor clothing company Patagonia will close its store in Georgetown, and stores around the country, on Election Day. The Mount Vernon bakery and cafe is putting an election spin on their Tuesday movie nights by screening "Election," starring Reese Witherspoon and Matthew Broderick. The movie is scheduled to start at 7:30 p.m. Admission is free. Enjoy free Republic Restoratives bourbon tastings from 6 p.m. to 8 p.m. and featured cocktails. The Capitol Hill bar promises more specials for anyone sporting a dapper bow tie. The Penn Quarter bar is offering classic cocktails like the Old Fashioned ($7) and $4 tacos with elevated fillings like pork belly, roasted veggies and drunken cod. Denizens in Silver Spring will be screening election results until 11 p.m.
Old Town Alexandria’s Fish Market will show results on its 15 TVs and serve drinks inspired by America's most drunken presidents, including a Ulysses S. Grant Manhattan and the Grover Cleveland Martini ($7). There's also a $11.99 taco plate special. Show your "I Voted" sticker at this Penn Quarter basement bar for 10 percent off your bar tab. An additional 10 percent of your purchase will go to Planned Parenthood of Metropolitan Washington. Decompress with skee ball and a $3 beer on H Street. The all-day bakery and cafe in Alexandria is giving all guests with a visible "I Voted" sticker a free 12-ounce drip coffee. While you’re there, don’t sleep on pastry chef Jonni Scott’s out-of-this-world pastries and breads (everything-spiced croissants, anyone?). The 1940s-style restaurant on Franklin Square is offering extended happy hour beverage specials for Election Day in the bar from 4 pm to 10 p.m., including $5 drafts. This Columbia Heights neighborhood spot is showing the election results on TVs and promises to offer shot and champagne specials "as needed." Shaw's Tavern is firing up all their TVs while offering half-priced pizza and burgers alongside $7 red, blue and purple cocktails. Vote early in the day to snag a seat at Dupont's Teddy & The Bully Bar before 7 p.m. for $3 hot dogs, $1.25 oysters and more food specials. All evening, you can grab $5 American Mules and $7 red and white wines. Two screens will show election results. Head upstairs at the H Street Corridor spot for $2 tacos (while they last), $5 Jameson and $14 Miller Lite pitchers. Tag The Well in your "I Voted" social media post and get 15 extra minutes on your massage for free. If you've been stressing about this election, the Columbia Heights massage spot can help. Upper West Side Cafe in West End will offer voters a free draft beer on November 6 when they show their “I Voted” sticker. Pair your free draft with one of their new small bites like the crispy shrimp sliders or chicken dumplings.